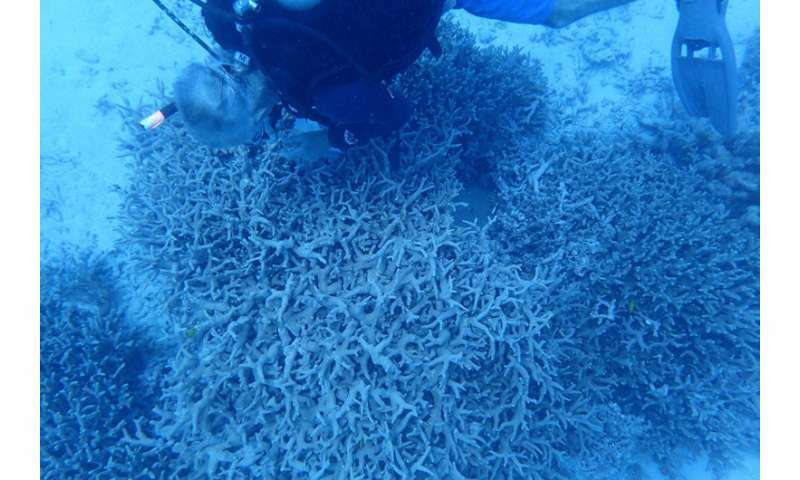 More than 70 years after the U.S. tested atomic bombs on a ring of sand in the Pacific Ocean called Bikini Atoll, Stanford researchers are studying how long-term radiation exposure there has affected corals that normally grow for centuries without developing cancer. The researchers' work is featured in today's (June 28) episode of "Big Pacific," a five-week PBS series about species, natural phenomena and behaviors of the Pacific Ocean. Beyond corals, López and Palumbi aim to understand how Bikini's larger ecosystem continues to thrive in terms of biodiversity and to expose any hidden genetic damage. To that end, López, the project's lead, decided to also look at platter-size crabs that eat coconuts filled with a radioactive isotope from groundwater. How do the crabs survive, grow and reproduce with such a burden of radioactivity? To answer this and other questions about radiation's genetic impacts, López and Palumbi will also compare their species samples with specimens collected on Bikini by Smithsonian Institution researchers just before the atomic tests. "Humans and many other animals exposed to radiation OFTEN develop DNA mutations in fast-dividing tissues that can result in cancer." This is simply not true. Apart from the thyroid cancer incident with contaminated dairy products in Ukraine, there is no measurable increase of cancer in neither Chernobyl nor Fukushima.